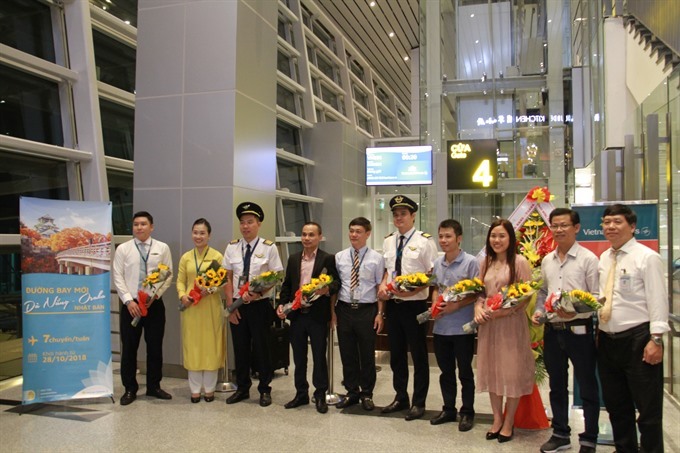 Vietnam Airlines launched new route between the central city of Da Nang and Osaka, connecting Viet Nam and Japan. The first flight coded VN336 departed from Da Nang International Airport at 00:20 on Sunday and landed at Osaka Airport at 7am (local time) on the same day. The flight time is about 4 hours and 30 minutes. With seven flights a week, the new Da Nang-Osaka route uses Airbus A321s. To celebrate the new flight, from October 28 to January 31, 2019, Vietnam Airlines’ Golden Lotus members will be awarded an additional 2,000 air miles on Business Class and 1,000 to 1,500 miles for economy class between Da Nang and Osaka. The new route will provide more options for passengers travelling between the two countries in the context of growing bilateral relations between Viet Nam and Japan. The Japanese tourists visiting Đà Nẵng from 2011 to 2017 increased by more than 18 times. This is Vietnam Airlines 11th route to Japan, playing a key position in connecting the two countries.